Enjoy this spacious home tucked back in the woods and miles away from it all! Caledonia Cottage & Tiny Home is a spacious home located in the hills above Grand Marais, MN. Located in the middle of nowhere, this home is a true escape from the ordinary. Curl up in the living room with a good book after a long day of exploring the North Shore. Or watch a movie or play a board game with the family. The semi-open living area means family and friends can always be close during your vacation. The kitchen is spacious and is well equipped with what you will need to prepare a home cooked meal during your stay. Full sized kitchen appliances, including a dishwasher, makes preparing meals a breeze. Sit at the dining room table in the kitchen or the attached sun room to enjoy your meals. The master bedroom has a queen sized bed and attached bathroom. Enjoy the Bohemian/North Wood eclectic style of the master bedroom. The attached bathroom features a large vanity and a walk-in shower. The second bedroom has a queen bed. The second bedroom also has a cozy sitting area where you can sit back and relax. The bonus back bedroom has a full sized futon. The bonus room serves as a multi-purpose room where you can sleep, read, or get some work done should you have to during your stay. Bring your laptop or use the desk as a place to write your next great novel. Or grab a book and sit back in the comfy arm chair. The sun porch is a spacious addition that will give your group plenty of room to spread out. The sun room will feature an additional eating area once fully furnished, as well as another sitting area. The sun room is the perfect spot to do some bird watching and look for deer casually roaming through the yard. The full sized bathroom in the hallway has a large tub and shower. Coming for an extended stay No need to over pack. You can do your laundry in the home`s laundry room. At Caledonia Cottage you are far away from it all- surrounded by nature. It`s called Caledonia Cottage & Tiny Home for a reason- the property has it`s own Tiny Home which serves as an additional sleeping area. Caledonia Cottage and Tiny Home the perfect blend of a North Woods retreat with easy access to the charming community of Grand Marais. 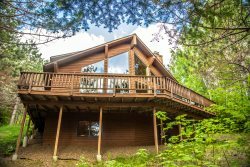 Many of northern Minnesota’s treasured animal species share the natural setting with you at this quiet home in the North Woods. Bears, wolves, bobcats and other animals are known to reside in this particular area, so don’t be surprised to safely view one from the spacious deck or through the many large windows featured on the home. Caledonia Cottage and Tiny Home is located just six miles from downtown Grand Marais and its many unique offerings. Featuring a distinct collection of locally-owned shops, restaurants and venues for live music, Grand Marias is a gem situated on the shores of Lake Superior. spending time with family and friends in this beautiful, natural setting. In addition, this home is dog-friendly. There is a two-dog maximum and an additional fee required to bring your pet. Sorry, no cats or other animals. Note: The Tiny Home is currently being converted into a comfortable living space and should be available to rent by summer 2019. Currently, we are not listing it as available in the event that work on the home takes longer than expected.